Tommy’s time with Jason is over, but Friday the 13th Part VII: The New Blood introduces a main character, Tina, who, much like Tommy, is haunted by her traumatic past. 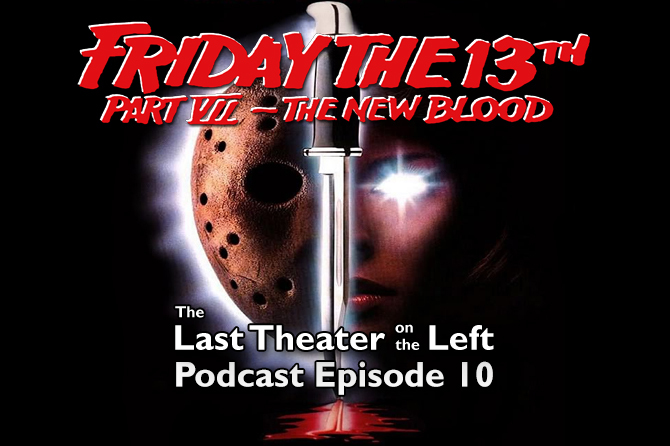 The similarity to Tommy is clear, but listen to this, night seven of The Last Theater on the Left’s series of 13 daily podcasts, to find out how Tina is also written to somewhat mirror Jason Voorhees. In this episode, chris and Joey attempt to make sense of the movie and draw out the plot points that actually have a lot of meaning, despite what the story-squashing presence of Jason (and some of the questionable decisions from the filmmakers). It all ends with a completely implausible battle of mind versus matter, but is the movie actually better than chris and Joey remember it being?